The smell of the pines, the park-like setting of the golf course. This airy modern home is tucked away in a very private location at St. Andrews By-The-Lake. 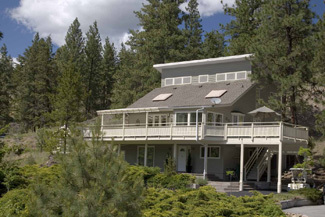 Architecturally designed with vaulted ceilings and plenty of skylights, there are 3 levels. The main floor has a wide open living area with updated kitchen, nook, dining room/ living room. There is a guest bedroom and laundry room. Expansive decking on three sides at this level extend the living space in the summer. Above are 2 other bedrooms and a lofted nook for a computer. Below is a home-theater room complete with TV, sound system and theater chairs, plus a small hobby room. Low maintenance landscaping, workshop, carport and golf-cart parking. No age restriction and just 15 minutes to Penticton. Free golf for owners and their families on the popular 9-hole course. Club house, tennis court, swimming pool. See walk-through video. Download feature sheet for details on golf course, strata and extensive upgrades to the house.